K2 makes an unexpected but welcome return to the Thrill-Ride category with the Bolt, flagship of their 2013-2014 Precision/Piste ski series. The Bolt is in many ways similar to Nordica's Fire Arrow EDT: both skis employ design elements stolen directly from their superhuman world cup race stock relatives, blended with cutting-edge technological advances plus of course modern ski geometry—ie, rocker. 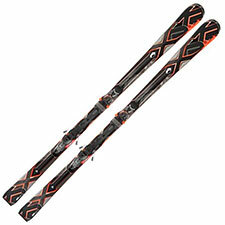 Similarly again, both skis succeed by keeping quite a lot of that elite-level feel without requiring elite-level skills. As has proven to be the rule in this rocker-race fusion category, the Bolt does sacrifice some versatility to achieve its screaming performance, particularly regarding turn shapes. However, I do rate it as slightly less demanding than the Fire Arrow, and therefore (perhaps!) slightly more fun. Just don't think for a minute that means you're getting a de-tuned ride. Of the 2014 skis I tried at this year's SIA Winter Park Demo, the Bolt was absolutely at the top of the list when it came to speed. Take a look at that relatively skinny 99 millimeter tail, which directly encourages you to point the ski down the hill and hang on for dear life. With regard to edge grip and more importantly subjective edging control, K2 has unquestionably worked a bit of magic here. The Bolt combines tenacious grip with a silky, effortless release, making even very hard snow feel almost like butter beneath your edges. The effect was so notable I can still feel it in my legs—an incredible combination of bite and nuance. Purely on the basis of grin factor, the Bolt was a huge success for me. I wasn't necessarily feeling amped up when I stepped on a pair, but the Bolt delivered easily the biggest adrenaline hit of the day, leaving me wide-eyed and wanting more. Liabilities are obvious and very typical of type. As mentioned, versatility is limited. In my notes I wrote, "No short-radius turns—none." Bolt owners should fall almost exclusively into the category of high speed junkies operating on steep, wide-open groomed trails far, far away from the SLOW signs. If that's you, have at it: test your quad strength and your nerve versus the Bolt's astonishing ability to crank up the G-forces. I'm betting you'll blink first.